Be warned. This post is a rant. Maybe not as heated as the great brushetta* rant of 2011 which is still spoken of in hushed tones on the shores of Lake Garda, but a rant never the less. It is also a rant in three parts, so are you sitting comfortably? Then I’ll begin. Part One. 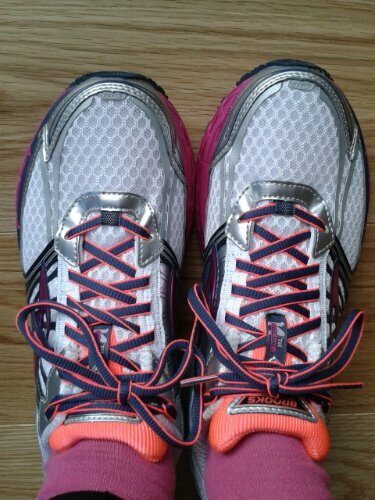 Once I got into running and started buying ‘proper’ running kit (rather than shuffling along in old trainers and jeans hoping anyone seeing me wouldn’t realise I was trying to run) I quickly realised that many companies seem to believe that if a product is designed specifically for Women, it has to be Pink. 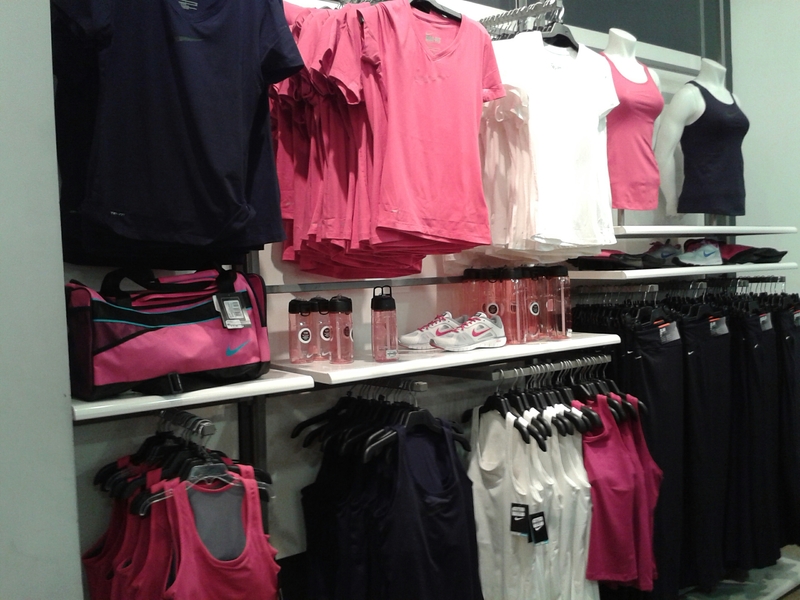 Pink running tops, pink shorts, pink head bands, pink water bottles, even pink running shoes. When I got home with my latest pair of unfortunately pink Brooks I immediately found a muddy path to run along to try and tone them down. Now don’t get me wrong, I know there are plenty of women who don’t mind pink, and plenty who adore it and the colour alone will sway their purchasing decisions. I would just like sports companies to appreciate that not ALL women want to dress like an overgrown Barbie doll each time they step outside to run. 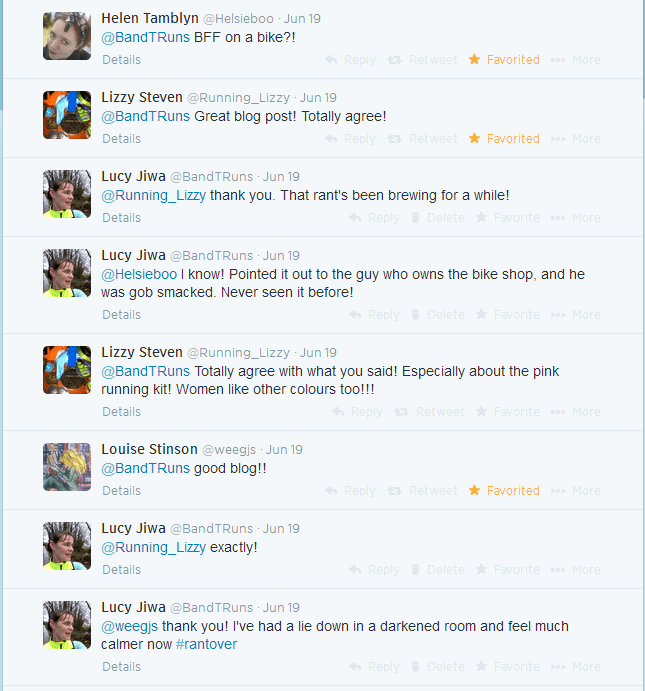 And so to part two of my rant – cycling. I have been impressed when looking at all types of cycling gear that companies producing the goods haven’t had the “all women want pink” brain washing. Hooray! I thought – a sport where women are treated seriously as sportspeople and consumers! Then I found SportsPursuit selling a range of ladies bibshorts made by Italian firm Giordana. After tweeting tbem, Sport Pursuit told me they were only using the product images supplied by the manufacturer, but after posting the above screen shot on Twitter I know from the responses I got that I wasn’t the only one who was shocked and disappointed. You get the general idea of the tone of the tweets I received. We were ranting in unison. As you might have guessed, I didn’t buy that particular brand of shorts, but instead a fantastically comfortable pair in black with blue stitching, although the padding inside was still PINK. Sigh. And so to part three, my new bike. 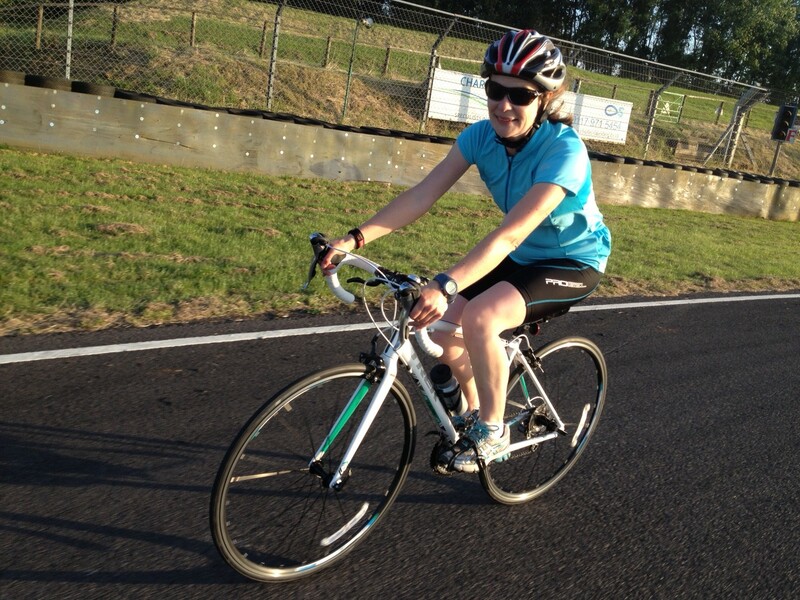 Having tried my husband’s bike I was interested ina bike designed more for the female anatomy (our body length to leg length ratio are different, and women are generally narrower across the shoulders). I was delighted that of the two women’s bikes I looked at, neither of them had any pink on them. Both were full of the same technical features as the men’s version, both were light, and the man in the shop assured me I would be fast on them. We eventually chose a Trek Lexa SL, in white with green ‘go faster’ strips on. Best Friends Forever. What is this – Hello Kitty? Best Friends Forever? BEST FRIENDS FOREVER?!! What is this – a ‘Hello Kitty’ bike? 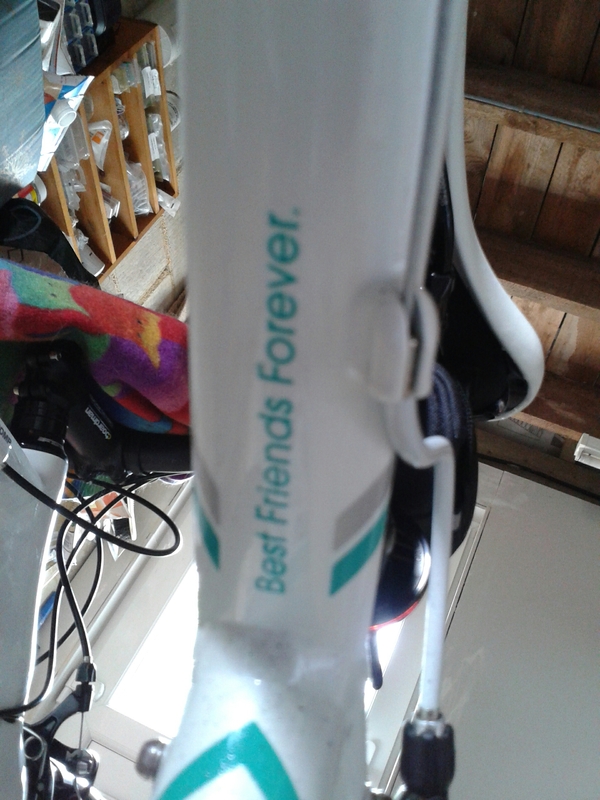 Does Jens Voigt** have a bike with “BFF” on? I doubt it. 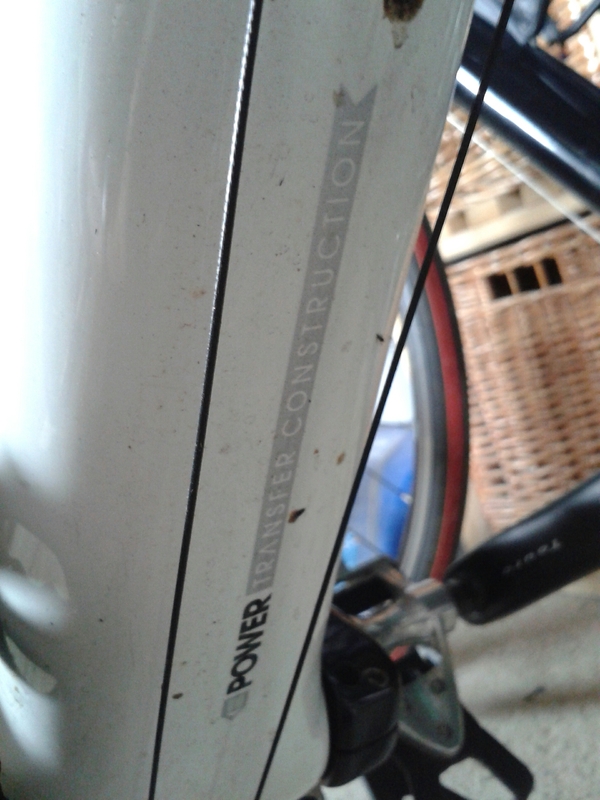 I suspect his bike has the phrase that is on my husband’s Trek bike “Power Transfer Construction“. Slightly more grown up. Give me a minute to calm down again. And breathe. I’m in my happy place. It’s not pink in here. So – rant over. in fact, 3 rants all rolled up into one. 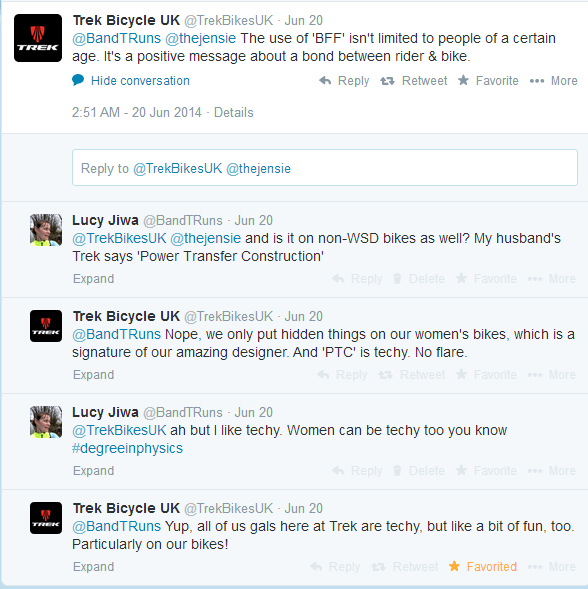 Why can’t sports manufacturers & companies treat women like sports people. Like athletes. In the same way that they treat men. We’re not children, we’re not simple, our bike is NOT necessarily our best friend, we have brains. We also have wallets and credit cards so ladies, let’s use our consumer power to show these companies what we want, and what we won’t put up with. If you have any more examples of how women are treated different to men when buying sporting products, please do share with me and feel free to join in my rant! * “It’s just stuff on toast!!! Why does it take 45 minutes to produce stuff on toast” is a precis of what was a very long rant on a hot and hungry day. 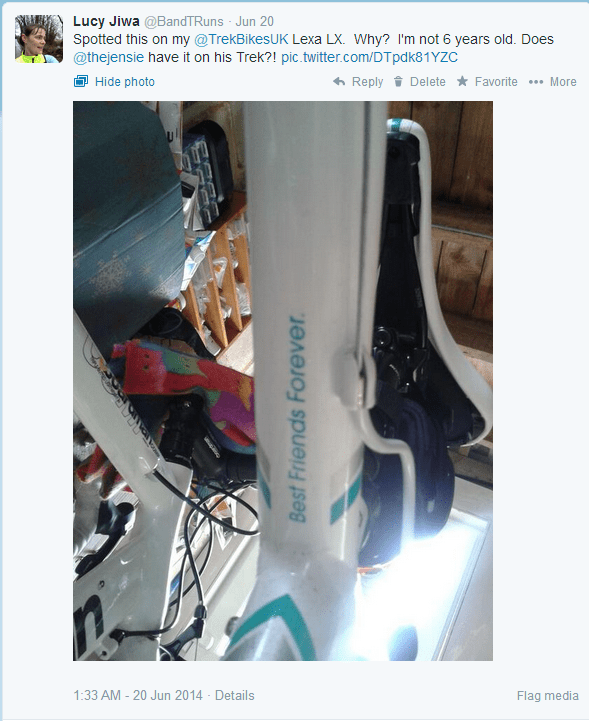 ** My all-time favourite pro-cyclist who coined the phrase “Shut up, legs!”, who goes geocaching, who has 6 children, who tweeted my son after his arm breaking bike crash saying he hoped he healed quickly, and who just seems like an all-round good guy. He currently rides for the pro team Trek Factory Racing. I need to ask him what is written on his bike.